After 30 years Bud Grace’s Piranha Club has come to an end. Piranha Club Sunday page for January 28, 2018. Here’s the very first Ernie Sunday from February 7, 1988. 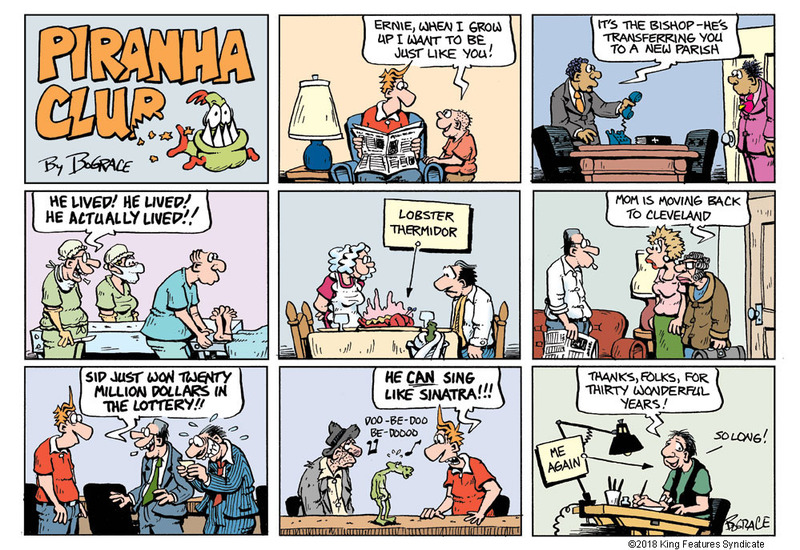 The strip’s name was changed to “Piranha Club” in 1998 (overseas it is still known as “Ernie”). Bud gave the reason for the change in this excerpt from a Q&A moderated by Suzanne Tobin of the Washington Post. 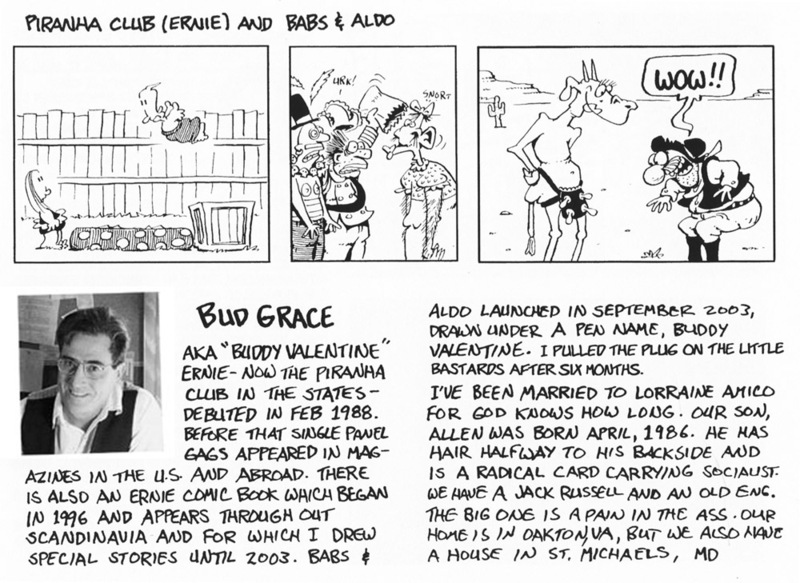 In 1989 Bud Grace received the the Adamson Award presented by the Swedish Academy of Comic Art as Best International Comic-Strip Cartoonist – and in 1993 he won the National Cartoonist Society’s Reuben Award for Best Newspaper Strip. 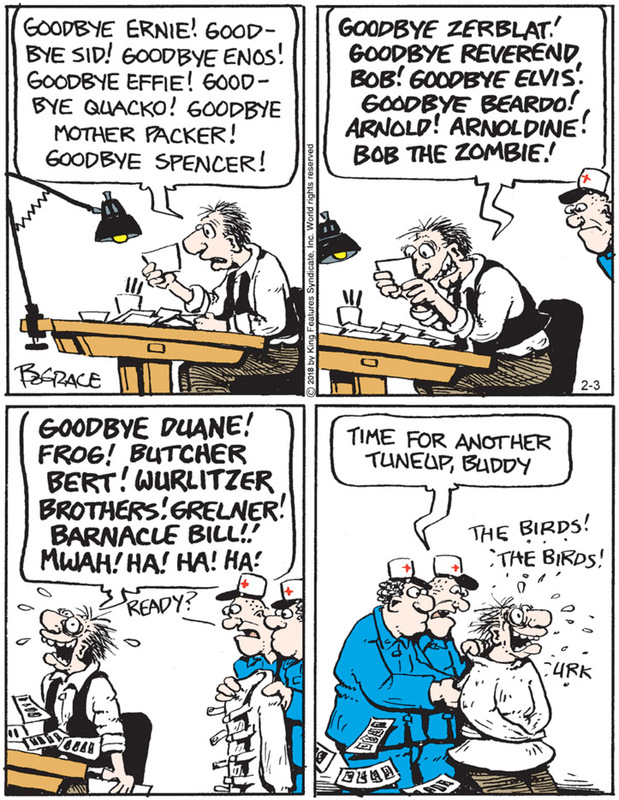 •Born in 1944, Bud Grace received a doctorate in physics from Florida State University before turning to cartooning. From the National Cartoonist Society member album. I was lucky enough to meet Bud Grace when I worked at King Features on staff as the colorist in the Comic Art Department. Cartoonists that didn’t come in regularly to drop stuff off because they didn’t live near New York (we’re talkin’ pre-internet here) we’d get the chance to see if they stopped in before the annual King Features Christmas party. Bud always reminded me of Groucho Marx when I’d see him at King. If you ever saw a Marx Brothers film, the energy would always pick up a notch when Groucho entered a scene. It was the same with Bud. 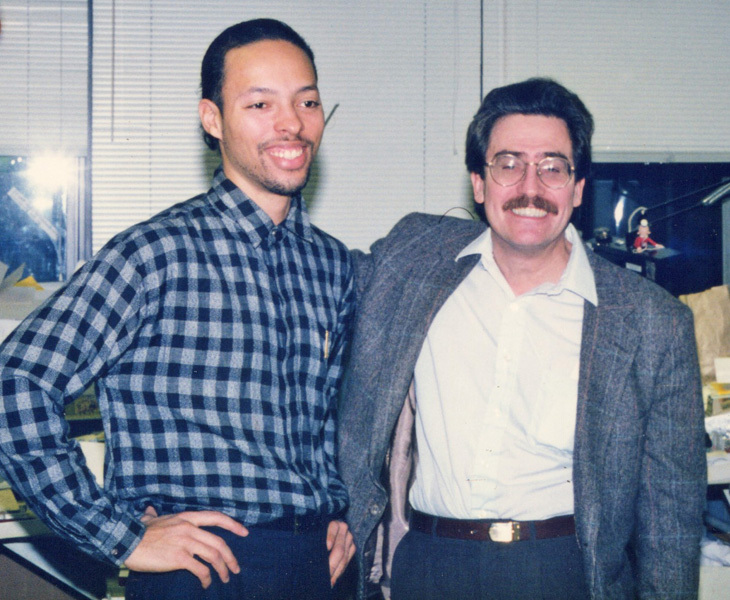 Here’s Bud Grace and fellow Comic Art department veteran, Jerry Craft, from December of 1992. When you worked in the Comic Art department at King you got to see the originals before they saw print. 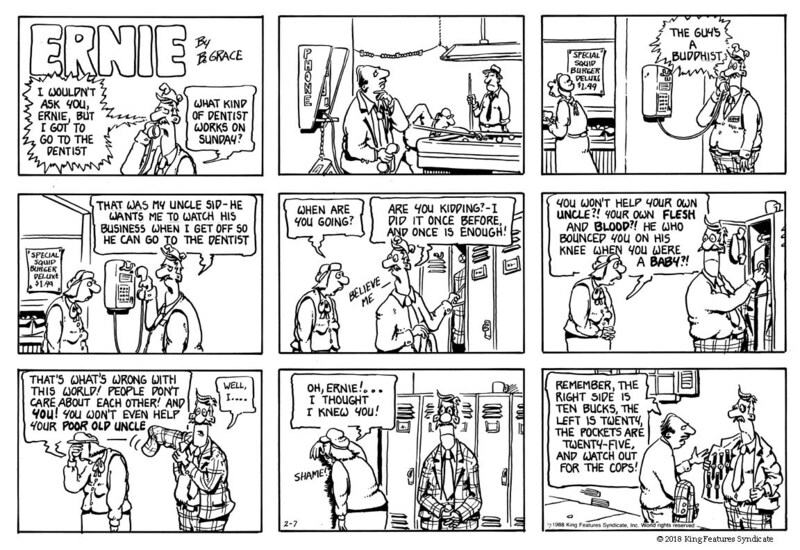 Here’s an example of an Ernie strip circa 1995 pre-edit. 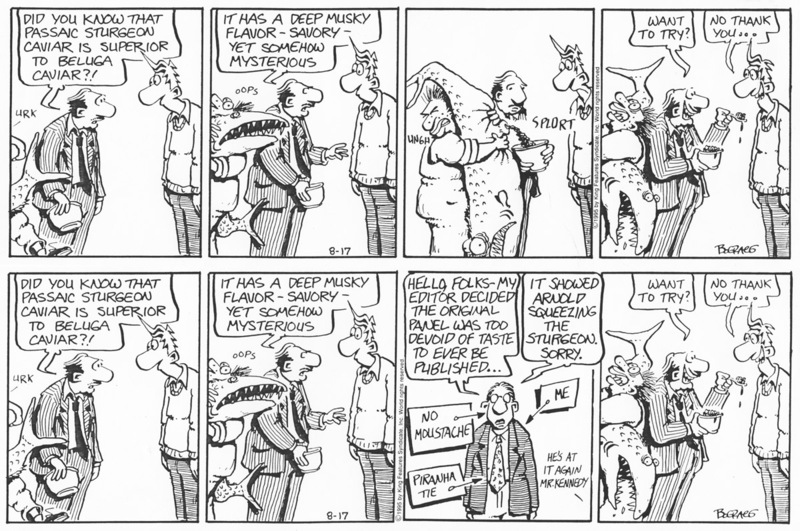 Bud of course knew that the above strip wouldn’t make it through editorial without a change to the language in the last panel. That he sent it in anyway was what made him a favorite in the Comic Art Department up at King. 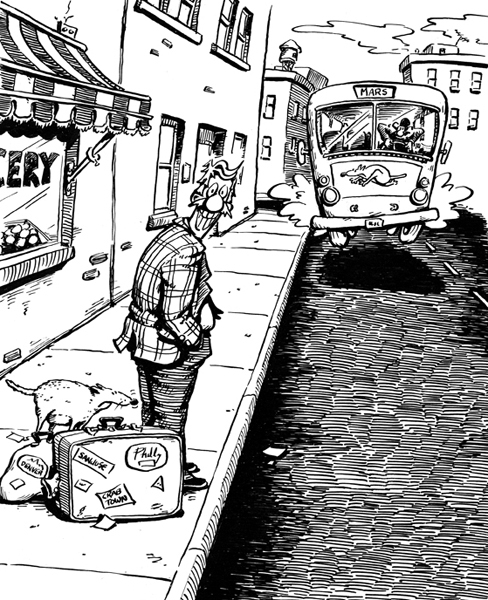 Here’s another example from 1995 where editorial actually made Bud change the drawing. And so with the final strip on February 3, 2018, we bid adieu to the Piranha Club. Fortunately we don’t have to say adieu to Bud Grace. You can still check in on Bud at BudGrace.com. And I’d make sure to check if I were you as info on upcoming book collections will be forthcoming. “Speaking of books, the publisher has been screwing around like crazy. The only book available right now is my Guess who Got Lucky collection of magazine cartoons. I’ll try to get things straightened out this week. Sorry. This entry was posted in Artist Spotlight, Bud Grace and tagged Bud Grace, Ernie, Piranha Club. Bookmark the permalink. Cheers Bud, all the best from down here in sunny South Africa. Our local news paper decided to drop your strip a few years ago…well there was such an outcry and threats of beheadings from us readers that it was back on faster than Sid could pick up ten bucks from the sidewalk. Just about the funniest strip out there’ I’v been working my way through all the strips from the start and am up to 2013. When I get to 2018, I’ll probably shed a tear.